Okay, so when I last left off on my zillion mile journey, I had just sent my daughter off to college. This followed an up-north book tour to Ely, and a trip to a couple of Minnesota state parks and the Minnesota State fair. After all of that "vacationing", I needed a vacation. As per the plan, we drove up to Mercer the day after we'd gotten home from Minnesota. 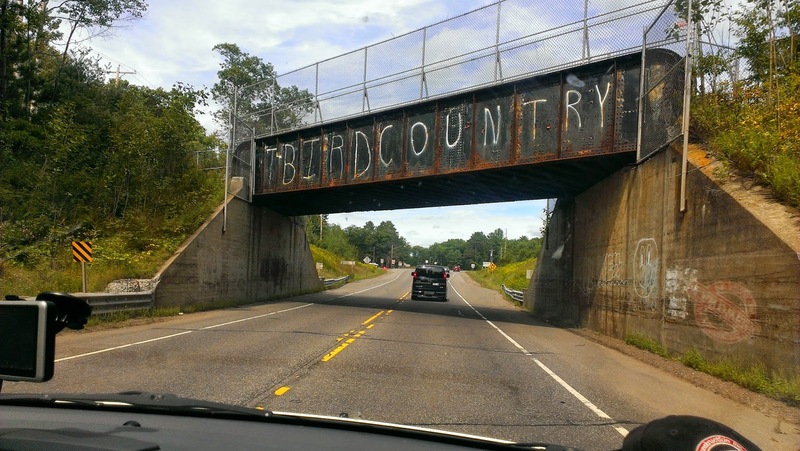 We always know when we're getting close to our destination when we see the graffiti on the railroad bridge over highway 51 that reads "T-Bird Country". I've been told that the T-Birds are the mascot of the local high school. In any case, whenever I see that sign, my blood pressure drops another 10 points. It means rest and relaxation. There were several standout moments at the cabin this year. The first was while Steve and I were fishing on Friday morning. We were on our favorite non-disclosed lake in the early afternoon hours when I got a bite on my spinning rod while throwing a bucktail lure. I told Steve that it felt like it was good sized so he readied the net. As it approached, the fish, which we quickly realized was a musky, dove and tried to go under the boat. I pulled it back out so Steve could make a stab at it with the net. Just as I was bringing it in for the last few feet, the leader broke and my line smacked Steve in the face. I stood there in shock. I might have cursed a time or two, I can't recall. Or, wait a minute. Yep, I guess I did. It might have been loud too. Steve and I guessed it at about a 32-34" muskie. My brother Tom, who wasn't there, said it was nice of the fish to have allowed us to measure it before it broke the leader. He said it made for a much more accurate fish story. It's good to know that the BWCA sibling tease/teardown is still alive and well. In any case, I thought about the fish the rest of the weekend. I'm still thinking about the fish. I've rehashed what I should have done differently - more drag, tire the fish out, don't horse it - but none of that can change the fact that the leader broke. It might have helped prevent it, but, oh, never mind. It makes me mad just reliving it. One of the other memorable moments from the weekend took place in the screen porch of my brother Paul's cabin one afternoon. Somehow all the boys ended up there, including Steve, Paul, Ben, his friend Van and myself. Over the course of a couple of beers with Paul and Steve we all got to laughing pretty hard a couple of times. Boys being boys - talking fishing, jobs, sports and life. I called the event the "sweat lodge" because it was kind of a coming-of-age moment for the boys. We talked about goofy stuff, but some grown up stuff too. Paul had some moments of great candor, I'll call them. The boys who also fished for a time in the boat with Paul thought he was a scream, with his bluntness and sometimes colorful language. Ben will likely never forget Paul's description of his jury duty stint where he described the plaintiff getting needles stuck in his neck. As I said, it was a bit candid. Too candid sometimes. But like we said, what happens at the cabin stays at the cabin. Another memorable moment took place on the water. One morning on while fishing near Paul's boat on Spider Lake, he managed to land a small musky while we watched. 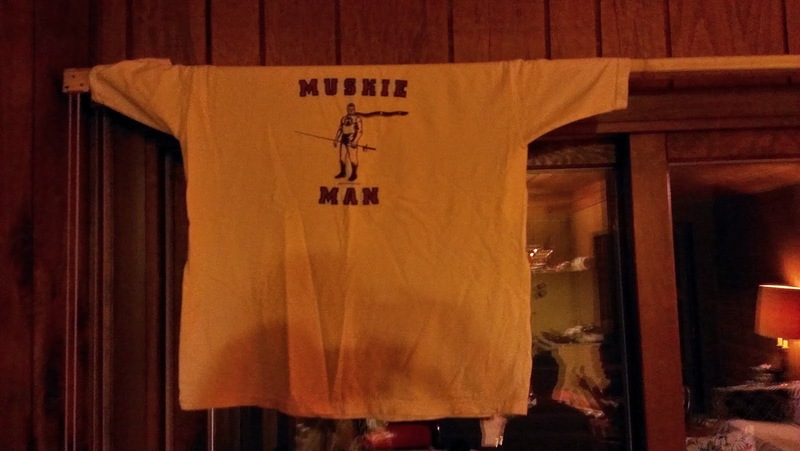 It was a small musky for sure, but as the saying goes, "A musky is a musky". One of my hopes going into the weekend was for Paul to catch one. He tries hard every year, and since I'd gotten one the day before - sort of - I was hoping he'd get one. Mission accomplished. So, the legacy continues. I love the tradition we've created and it's so cool that our kids are part of it now. Even if some of it does take part in the screen-porch-sweat-lodge-of-laughter-mischief-and-tomfoolery. 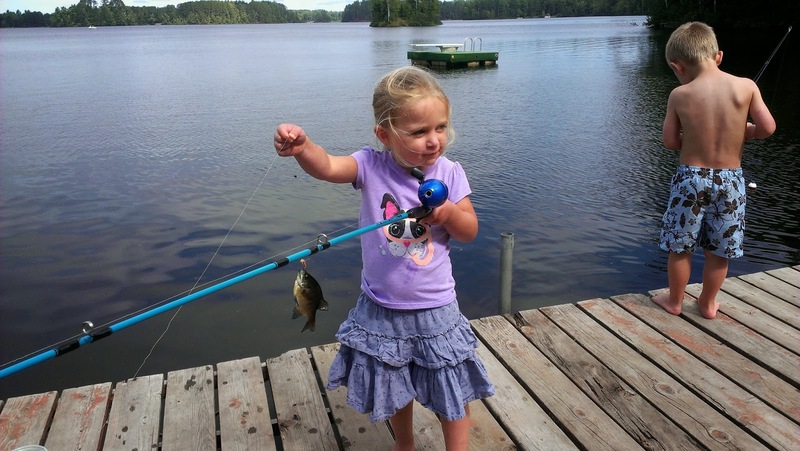 The last memorable event was helping my friend's kids catch fish. There is nothing like fishing with kids. I love introducing people to the sport. With kids, they get such a rush out of it that it makes it fun for me as well. It's always lots of work, hooking worms, unhooking fish and maintaining order on the dock, but all worth it. The kids (5 and 4) had a blast and I think they are "hooked" on fishing, so to speak.